Salt Lake City’s Star of India serves authentic curry, masala, biryani and naan with all-natural spices. The downtown restaurant also offers an extensive menu of vegetarian curries and seafood delights. For dessert, finish with the restaurant’s signature specialty Indian sweets. There’s also a terrific all-you-can-eat lunch buffet that usually features curries, tandoori chicken, veggie dishes, naan, and lots more. 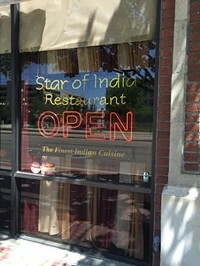 Star of India serves up authentic curry, masala, biryani and nans with all-natural spices. There’s also an extensive vegetarian menu. For dessert, finish up with the restaurant's signature specialty Indian sweets. There’s also a terrific all-you-can-eat lunch buffet which usually features curries, tandoori chicken, veggie dishes, naan, and lots more. Very friendly service, to boot.